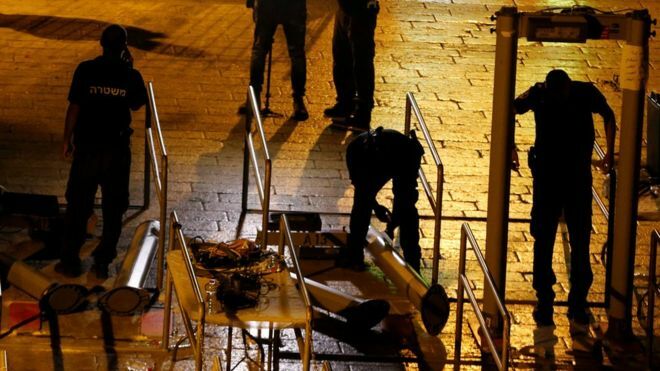 Israel has removed metal detectors from outside a holy site in East Jerusalem after uproar from Palestinians over their recent introduction. It said it plans to replace them with less obtrusive surveillance. However Muslim leaders have called on worshippers to continue boycotting the sacred compound for now. There were deadly clashes after the metal detectors were set up, which Palestinians saw as an Israeli attempt to assert control over the site. Israel said they were necessary to prevent weapons being smuggled in. It followed the killing on 14 July of two Israeli policemen by Israeli-Arab gunmen, who police say had hidden their weapons on the hilltop site known to Jews as the Temple Mount and Muslims as Haram al-Sharif.